Hayes Primary School in Bromley has achieved the Inclusive School Award for the second time. Hayes Primary School is a popular 3 form entry school. It is part of the 7 school MAT, The Spring Partnership, set up in 2014. The school has below average numbers of EAL, ethnic minority and SEN pupils, with 10% of pupils being on the SEND register. There are currently 3 pupils at the school with an EHCP, with a further 2 pending, and 5 in receipt of additional funding. Governors believe that “Inclusivity permeates throughout the school.” The Headteacher feels that gaining the IQM has been an important part of the school improvement process. The school’s warm and welcoming ethos is evident from the moment that you step into reception. Staff are friendly and clearly passionate about their school, pupils are keen, enthusiastic and polite. There is a clear sense of “team” within Hayes. The speech and language therapist who works very closely with the school explained that, “Teachers embrace inclusion”. Key Stage 2 results for the school at the end of 2017/18 show that the school is performing well above the national average with an impressive percentage of pupils gaining greater depth across the board. Despite this, the school is very keen to continue to move forward and there is a great deal of enthusiasm behind new projects, including fundraising for their music hub and improving outdoor education. The SENCO is very knowledgeable and ensures that all stakeholders, including governors, are kept up to date with the inclusion agenda. Both staff and parents speak very highly of the support that she gives them. Since joining the school just over a year ago, the SENCo has introduced new SEN parents’ groups, which encourage parents to talk together and to benefit from external speakers. A recent meeting was held around the topic of anxiety. Tracking systems for pupils with SEND are thorough and frequently reviewed and show these children are making very good progress. The school employs a Family Liaison Lead, a counsellor and a mentor, who work closely together and alongside the safeguarding lead. This is a well-established team who know the families and the area very well. The pastoral team feel that there is excellent communication between themselves and the SLT. The school nurse visits termly to review care plans. Wellbeing was further highlighted during a specific wellbeing week, with visits from a doctor, yoga teacher and counsellor. The Family Liaison Lead says that, “The class teachers are amazing and are dedicated to the whole child.“ A reading dog visits the school weekly and is read to by targeted pupils. The school is open for pupils from 7.45 am each morning for a well-staffed breakfast club. Leaders are keen to ensure that the grounds are used as much as possible. Children are encouraged to use the field whatever the weather. Each class has its own shed for wellies and children are expected to play responsibly on the field. The corridors and classrooms are filled with lovely displays showing the children’s creativity and hard work. Visiting artists have worked with pupils to make some stunning papier-mâché woodland scenes. Other eye-catching boards include reviews written in the styles of TripAdvisor and a display on Brazil featuring Christ the Redeemer. Throughout the school inspirational quotes are displayed on the walls. Classrooms are vibrant and exciting; reading corners are welcoming. The children feel safe at school and know who they can talk to if they have a problem. Staff and governors are well trained in safeguarding, with regular updating. There are clear reporting procedures in place. Clear communication between the pastoral team and the safeguarding leads ensure that information is shared in order to keep all pupils safe. Some pupils are Junior Travel Ambassadors; their wallboard highlights the work they do to keep fellow pupils safe. The school has a team of well trained and enthusiastic Teaching Assistants who feel well supported by the SLT. Communication between the TAs and the SENCO is excellent. Hayes Primary employs a speech therapist who speaks passionately about the work that she does at the school. There is a clear process of assessment and she works closely with the TAs, class teachers and SENCO to ensure that the interventions and pre-teaching they offer are effective and followed up in class. Staff CPD is first rate, including the opportunity for NQTs to spend up to two weeks at the school prior to starting, in order to learn procedures, become familiar with staff and their new pupils. There is also a new action research scheme for teachers, which shapes the staff meetings. Research so far has included projects on higher achieving girls; fine and gross motor skills and outdoor learning. The school has an excellent reputation in the local community. On the day of the assessment new parents were being shown around the school on tours led by the year 6 pupils who promoted their school with enthusiasm. The children say that the best thing about school is the teachers, who, “Make learning fun” and run many clubs for them including football, netball, cross country, junior orchestra and Spanish. They discussed the trips and school journeys that they had been on in recent years, including trips to the Aquarium, Lullingstone Villa and a farm in Suffolk. They talked enthusiastically about a recent Saxon sleepover they had had at school, which included cooking on outdoor fires. They cited their favourite lessons as maths, particularly enjoying learning methods of computation and practising their mental maths skills. 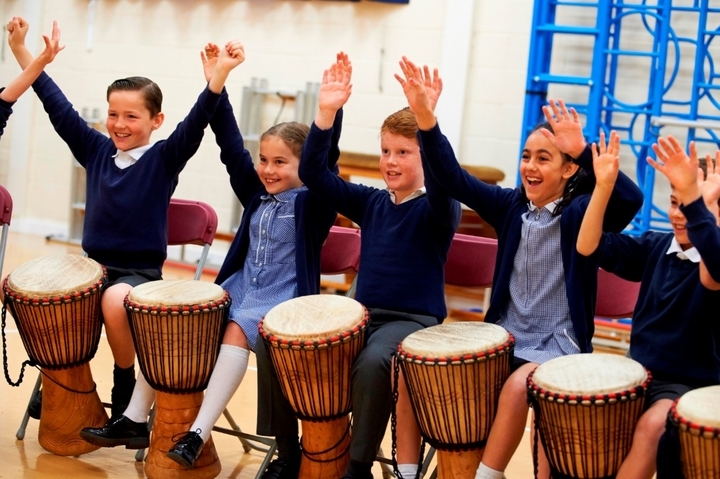 The curriculum is enhanced by the vast amount of music on offer to the pupils. Music is a strength at Hayes Primary and is ably led by a talented and enthusiastic year 6 teacher. The orchestra and choir perform impressively. The school also offers pBuzz lessons, an introduction to the skills needed to play the trombone and trumpet. Children learning this instrument are accompanied beautifully by the school orchestra. The school employs peripatetic teachers who give flute and piano lessons to individuals. Parents are also invited to watch their children perform as part of a rock band. The children also discussed the opportunity to be a part of the Band on The Run programme which taught them how to play a musical instrument in 15 lessons over 5 weeks.